Rinse the chicken inside and out and dry thoroughly. Salt and pepper then inside of the chicken the stuff the cavity with the orange slices, lemon slices, onion pieces and garlic cloves. Use kitchen twine to tie the legs together, tucking the wings under the body of the chicken. Place the chicken breast-side down on the roasting rack in a deep roasting pan. Roast the chicken for 15 minutes. Use the melted butter to baste the chicken allover. Reduce the oven temperature to 375 degrees F and continue to cook for 45 minutes. After 20 minutes baste the chicken again with butter. While the chicken is in the oven make the glaze. Whisk together the pomegranate molasses, orange juice, apricot jam and lemon juice until combined. Season with salt and pepper. After the 45 minutes are up flip the chicken so the breasts are up then coat allover with the glaze. Cook for 30 minutes, basting with the glaze again after 15 minutes. 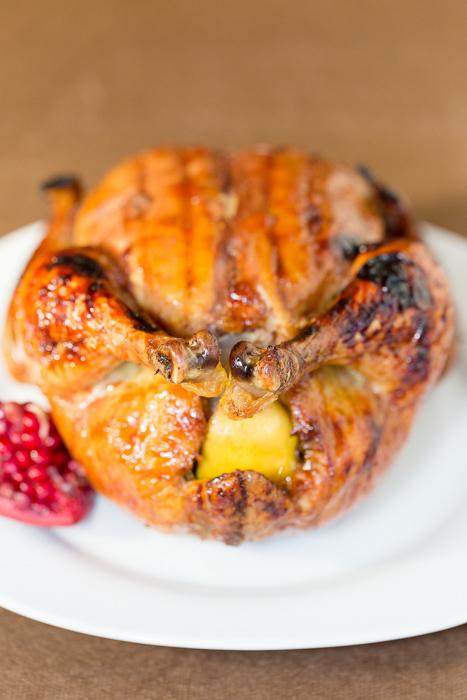 Remove from the oven when the chicken reaches an internal temperature of 165 degrees F or when the juices run clear when you cut between a leg and thigh.